The Chevy Traverse is the perfect minivan replacement. It has all carrying capacity of Chevy Suburban tucked into a more driver friendly package. With seating for up to eight, an amply powered V6, and tons of technology available; this might just be the most family friendly SUV in the midsize class. When you compare the Traverse with its larger siblings, the Tahoe and Suburban, the value provided becomes obvious. The Traverse costs significantly less than the Tahoe and gets better gas mileage and with more cargo capacity. Unless you need to tow, we’re not sure why you would choose the Tahoe over the Traverse. The Suburban provides just a few more cubes of space and one additional seat if equipped with three rows. If you like the luxurious cabin in the Suburban, the Premier trimmed Traverse comes quite close for ten thousand dollars less. We think the Traverse provides excellent value for the money and should be your top choice if you need over 100 cubes of cargo space. The Traverse is equipped with the GM LLT 3.6 liter V6 with direct injection that makes 281 hp @ 6,300rpm and 279 ft-lb of torque, plenty of power for its class. It’s not enough to post an astonishing quarter mile time, but the Traverse never really feels underpowered either. It pulls strong in every gear. Handling is average for the segment. Few are inspired by a midsize SUV’s suspension. The Traverse’s strength is its comfort, with the suspension soaking up bumps and potholes like a larger Tahoe while remaining more composed than the larger, truck-based Tahoe. Fuel economy is a weak point. 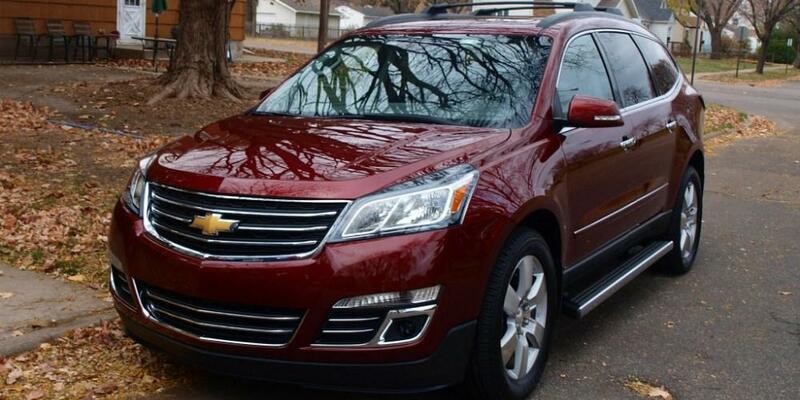 The Traverse’s heft makes it thirsty for fuel with an EPA rated 15 mpg city and 22 mpg highway. The lags well below the class average, though it is also the largest. For drivers used to Tahoes and other truck-based SUVs, the Traverse will reduce anxiety and inspire confidence. We believe the Traverse is a strong performer in the midsize SUV class. Inside the Traverse feels outdated when compared with many competitors in the midsize SUV segment. Despite the dated looks, the controls are easy to read and functional. The standard radio is nothing special but the optional MyLink infotainment system is one of the best in the class. The app-based interface is instinctive for smartphone users and offers Bluetooth integration. A rearview camera is not standard, as it should be in an SUV of this size. However, it is in all but the base model. The dash is finished with contrast stitched leather, giving the Traverse an upscale feel. The seats are comfortable and supportive if a bit lacking in side bolstering. The driver position is high and provides excellent visibility. There are two possible seating configurations. The standard is a 2nd and 3rd-row bench with split capability, allowing a capacity of 8 passengers. The second configuration is 2nd-row buckets with a 3rd-row bench. There’s enough legroom in the second and third to seat adults adequately. A staggering 116.3 cubic feet of cargo space is available with back rows down, that’s just 5.4 cubes less than the monstrous Suburban and enough to dwarf the class average. 24.4 cubic feet are available behind the third row and 70.3 behind the second row. If you’re looking for a spacious midsize SUV, the Traverse is undoubtedly the cavernous choice. The Traverse has a simple, stylish design that reflects its utilitarian values. A single port grille wearing a bowtie is flanked by dual cavity halogen headlamps. Below, another single port grille is flanked by intakes and topped with fog lamps in some models. 1LT and higher trims receive chrome and chrome trimmed grilles in lieu of the black plastic in the base model. The rear receives modern taillights with integrated turn signals. Trims with the dual exhaust appear more symmetrical. The side profile is interesting, as the straight lines rise at the rear to give the Traverse an athletic appearance. Depending on which trim you choose, the traverse sits on anything from 17in steel wheels to 20in aluminum wheels. We think the Traverse is good looking SUV that doesn’t try too hard. JD Power awards the Traverse with a 3 out of 5 reliability rating, indicating average reliability for the class. Consumer Reports gives it a higher 4 out of 5 predicted reliability rating. 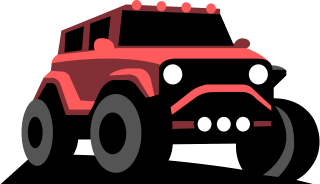 It is worth noting that the 2009-2011 models were plagued with all sorts of problems, from major engine and transmission issues to electrical shorts and malfunctions. Since then, reliability has steadily improved. For example, the 2009 Traverse had 187 Technical Service Bulletins issued by the NHTSA, while the 2017 has just 33 at the time of this writing. Most of the latter are benign, though you may want to know about an issue with the main USB port. It may not play music or charge at times, so you may want to stick with the Bluetooth. Considering the Traverse is in its eighth year of production, it makes sense that it has become more reliable. You’re better off buying a 2015 or later if you’re concerned with reliability. The Insurance Institute for Highway Safety crash tested the Traverse and offered its highest ratings in all categories but the small overlap front test, which it did not conduct. The National Highway Traffic Safety Administration awards the Traverse with a 5-star overall rating and 5 stars in every category but Rollover, where it received a 4-star rating. These are great ratings for the midsize SUV class, though many features that enhance the Traverse’s safety are only available on high trims. The Honda Pilot is our pick for the best alternative to the Traverse. Like the Traverse, the Pilot seats up to 8 and has a 280 hp V6. We’ll admit that the Pilot handles better than the traverse, with a more refined ride and smoother steering. The smaller size that makes the Pilot nimble causes it to lack the cargo capacity of the Traverse with 20 less cubic feet overall. The Pilot’s interior is nicer at the base level but not as nice as the Premier trimmed Traverse. The Honda does offer more safety features standard than the Traverse, where they are costly upgrades and only available on top trims. They are both quiet, comfortable riding SUVs that are great for road trips and soccer games. We think families on a budget should give preference to the Honda unless they need the extra space, it provides better value and much better fuel economy. We would consider the Premier trimmed Traverse a practical alternative to the Suburban and even some luxury SUVs for those who need an abundance of space. The base Traverse starts at $29,595 and is sparsely equipped when compared with many other GM offerings. You get cloth interior, a basic audio system with Bluetooth connectivity, a USB port, and not much else. Upgrade to the LS trim and modern necessities begin to pile up. For $32,195, Chevy adds larger 17in wheels, a rear vision camera, an aux jack, more USB ports, OnStar 4G LTE wifi hotspot, remote keyless entry, cruise control, and tire pressure monitoring. A Hit The Road Package is available for $925 that adds chrome steps below the doors with traction pads and a roof rack. The 1LT trim arrives at $34,995 and has larger 18in aluminum wheels, rear park assist, remote vehicle start, fog lamps, upgraded mirrors with indicators, tinted windows, more airbags, and an 8-way power adjustable driver seat. The Hit The Road Package is also available on the 1LT trim along with the Style and Technology Package that equips the front seats with heaters, power-variable power steering, 20in wheels and tires, and Chevrolet MyLink infotainment system for $1,250. For $37,545, a 2LT trimmed Traverse receives 2nd-row bucket seats, a power rear liftgate, the Chevrolet Mylink infotainment system, a premium Bose 10-speaker sound system, rear seat audio controls with a headphone jack, automatic tri-zone climate control, auto-dimming rearview mirror, heated front seats, and a universal home remote. The Hit The Road Package is also available, along with a Leather and Driver Confidence Package for $2,450 and a Graphite Special Edition for $2,345. The first adds memory settings to the driver seat and mirrors, leather-appointed seating on first and second rows, blind zone alert, rear cross traffic alert, power windows with express down, and upgraded mirrors. The second dresses the Traverse with 20in dark charcoal wheels, black bowties, trailering equipment, dual exhaust with bright tips, molded assist steps, and a MyLink system with navigation. Lastly, the Premier trimmed Traverse has a MSRP of $42,940 and endows this SUV with chrome accents, MyLink with Navigation, a dual exhaust with bright tips, variable power steering, upgraded mirrors with side blind zone alert, 20in machined aluminum wheels, NavTraffic, express up and down windows, memory settings for mirrors and seat, leather seats throughout, power adjustable front seats, heated and cooled front seats, heated steering wheel, forward collision alert, and lane departure warning. The Hit The Road Package is also available for $925. All Wheel Drive is available on all trims except base for an additional $1,000 dollars.